The Zika virus has been confirmed to cause a rare birth defect called microcephaly and other severe problems of the brain, according to a new report from the U.S. Centers for Disease Control and Prevention. Health officials across the globe have suspected for months a link between the virus and the birth defect, characterized by an abnormally small head and brain. Officials said today the evidence is overwhelming that exposure to virus in utero causes the birth defect. CDC Director Dr. Tom Frieden called the news a "turning point" in a fight against the virus that has continued to spread throughout the Americas. "It is now clear that the virus causes microcephaly," Frieden said. "We've now confirmed what mounting evidence has suggested, affirming our early guidance to pregnant women and their partners to take steps to avoid Zika infection and to health care professionals who are talking to patients every day. We are working to do everything possible to protect the American public." The CDC is launching new studies to see if other birth defects are connected to the mosquito-borne virus, Frieden said, calling the link "unprecedented" and pointing out there has never been a mosquito-borne virus that causes birth defects in humans. 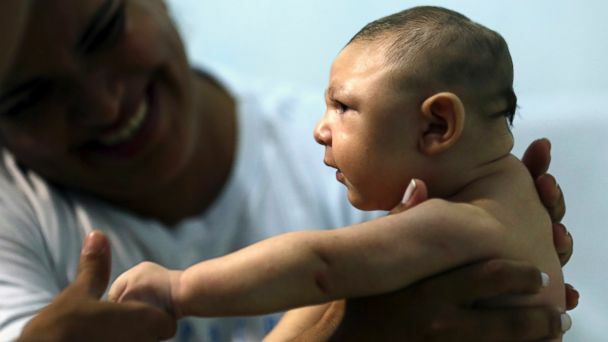 An increase of the birth defect was first detected in Brazil last September months after a large outbreak of the Zika virus. "We believe microcephaly will be a part of a range of birth defects that may affect women infected at a particular time or at any time during pregnancy," Frieden told reporters. The findings were published today in the New England Journal of Medicine by CDC researchers who did a thorough review of the available scientific evidence linking the Zika virus and the birth defect. Dr. Sonja Rasmussen, lead author and director for the Study Division of Public Health Information and Dissemination at the CDC, told reporters today that scientists found a consistent pattern of defects in infants exposed to the virus in utero. Additionally, she said the virus had been found in brain tissue from deceased infants with microcephaly. Despite the advances that researchers have made in recent months, Rasmussen said "many questions remain," including how often birth defects occur in fetuses that are exposed to the virus and if a pregnant woman is more at risk during specific stages of pregnancy. "Not all babies born to mothers who are infected with Zika virus during pregnancy will have problems," Rasmussen said. "We need to learn to answer this question -- if a woman is infected during pregnancy, how often will her fetus have birth defects or other problems?" The CDC is also investigating if the virus is linked to an increased likelihood of developing Guillain-Barre syndrome, an immunological reaction that can result in temporarily paralysis in adults. The CDC is not currently changing its recommendations regarding pregnant women or women who may become pregnant. Currently, the CDC advises pregnant women to avoid areas where Zika virus is being transmitted from mosquitoes to people. The agency is also advising men who travel to an area with active Zika transmission and who have a pregnant partner to abstain from sexual activity or use barrier contraception for the duration of the pregnancy. Dr. William Schaffner, an infectious disease expert at Vanderbilt University Medical School, said the study is a culmination of months of work and shows the threat to public health. "It brings together the various lines of evidence that in the end provide a very convincing conclusion that the outbreak of microcephaly that we're seeing Brazil ... is indeed associated with Zika virus, causally," Schaffner said.